These new developments increase the realism of the sea ice model. However, incorporating these developments in a climate model does not result in better climate simulations as a matter of course. Many physical and empirical parameters are not very well constrained in a sea ice model requiring a tuning process applying observational data. In the past, most of the tuning has been based on sea ice concentration data derived from passive microwave imagery. This is a problem because realistic sea ice thickness is crucial for simulating variability and trends of the sea ice cover. Using radar altimetry, sea ice thickness estimates are available from CryoSat-2 (CS2) (e.g. 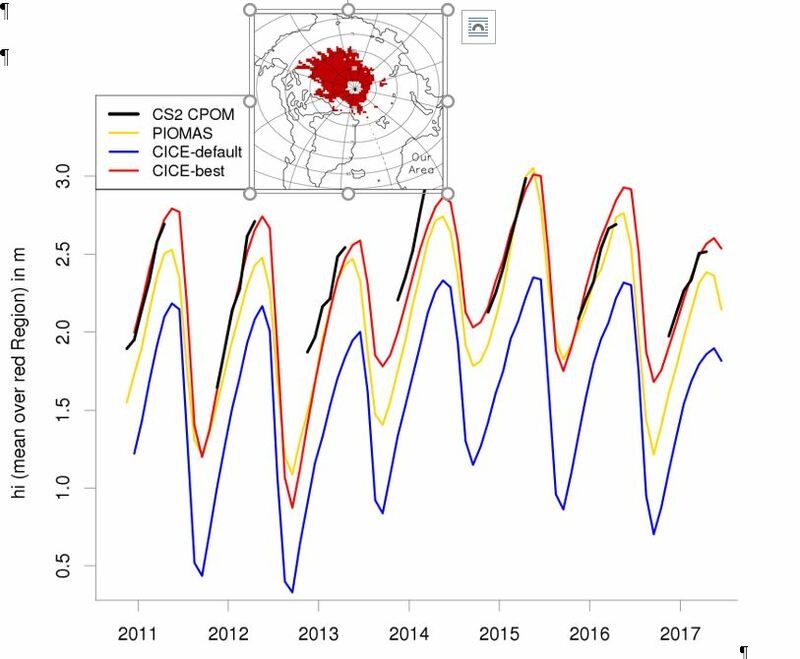 from the Centre for Polar Observation and Modelling) during the ice growth seasons since 2010. However, the discrimination of ice and open water, the discrimination of ice type, retracking radar waveforms to obtain height estimates, constructing of sea surface height beneath the ice, and estimating the depth of the snow cover result in a grid cell ice thickness uncertainty of about 25 %. This entry was posted in antarctica, Arctic, Climate, Climate change, Climate modelling. Bookmark the permalink.